Diane Tye, a folklorist rooted in Atlantic Canada, frequently writes about hidden meanings found in everyday life. 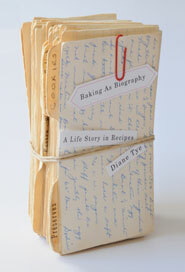 In Baking as Biography, she turns her critical gaze inward to examine the custom of passing down recipes through family. The recipes of her mother, Lauren Tye, provide the focal point of this memoir, revealing valuable and universal stories. Lauren died in mid-life from cancer, a tragic family loss also giving insight. And so, although Tye’s son grows up without his grandmother, he is reminded of her when Tye bakes. As part of a health-conscious generation, Tye confesses she doesn’t prepare Lauren’s butter and sugar laden desserts for social functions, as was Lauren’s constant obligation, as a minister’s wife, beginning in the 1950s. But Tye does share these sweet delights with her own family. Tye’s father and brother also find meaning in Lauren’s cooking, as Tye sensitively portrays, based on her interviews and observations with them. Her sister, born with a hearing impairment, has had a sense of life-long alienation from her family of origin, Tye comes to understand, so her connection to her mother’s recipes is different again. The reader glimpses the lives of women past through this study of the post-war generation, as well as their attitudes toward domestic chores, family and public gatherings. Tye also includes telling details about food and baking. White sugar takes over from molasses, “the poor man’s food,” on kitchen shelves in the Maritimes, for example, and a bounty of specialty ingredients in a woman’s baking once marked her social status in society. Despite an academic-style detachment and frequent referencing of sources, this is a seamless and nuanced narrative, lovingly told. Also included are black and white photographs of Tye’s family—and food—captured within domestic and public settings. After reading Baking as Biography, the family recipe box is guaranteed to take on new meaning. The value of women’s work, performed out of duty, tradition and maternal love, shines through. This entry was posted on September 20, 2011 at 6:33 am and is filed under Book Reviews. You can follow any responses to this entry through the RSS 2.0 feed. You can leave a response, or trackback from your own site.